Jared Wheeler, 4D Application Engineer, explains why you might want to use one or more reference masks when you’re evaluating your data. A reference mask tells the software to use a particular area on the plot as the zero reference in height (Z). Points above the reference will have positive Z values and those below will have negative Z values. By default, the 4D InSpec analysis software sets the average of all the points in a measured area to zero. But if you’re looking at a depressed structure like a scratch, pit, or a dig from wear, or a machined recess that should be compared in depth to the original surface —or conversely, if you are examining a protruding defect like a rivet, burr or a blob of solder on a board— you want to measure the height of the depression/protrusion alone, in relation to the “true” surface. That’s when a reference mask comes in handy. 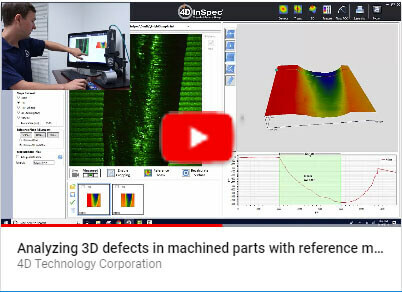 The video includes a step-by-step procedure on how to draw and set a reference mask, apply it to the next measurement or to the current measurement data, the effect it has on the reported values, and the effect it has on leveling and other data presentation. Includes a demonstration of using two reference masks so that your surface levels across the average of two separated zones. This is especially useful if you have surface form like a divided cylinder which, if you reference only only one side of the divide, will tilt the other side into a “sub-surface” orientation. Jared shows how to avoid this pitfall. You can implement reference masks and automatically apply them to successive measurements, which helps if you’re making the same type of measurement over and over.